Double Hammock With Case $49.95 (Reg. $250) + Free Shipping! Offer Available Again! This would be a great addition to your backyard or when you go camping. 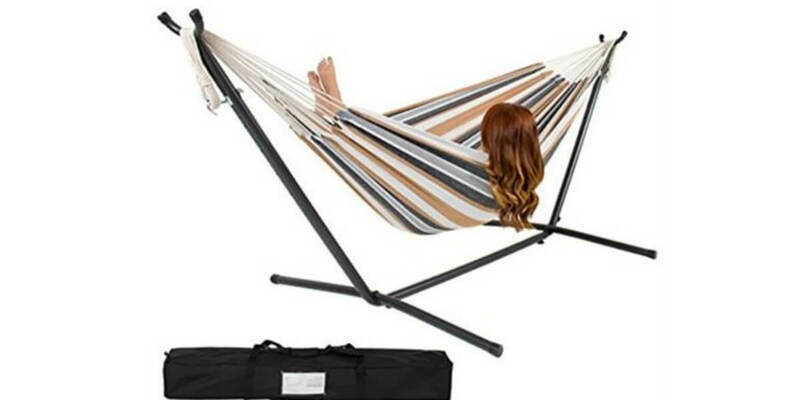 Get the Double Hammock With Case $49.95 (Reg. $250) + Free Shipping from NewEgg. Made of 100% cotton, this hammock is designed to keep you relaxed and comfortable in any outdoor space. It is able to accommodate two adults (up to 450 lbs.) Allowing you and a friend to enjoy sharing the hammock on a warm sunny day. For convenience and durability, it includes a stand that is constructed of sturdy and all weather-resin steel. Saving you time and money from having to purchase a stand separately. With the included carrying case, you can easily pack the hammock and take it anywhere you please with ease. Purchase today for a convenient and comfortable hammock that you won’t find anywhere else! Hoover Carpet Cleaner SteamVac $69.99 (Reg. $131.09) + Free Shipping!